families with children and to couples seeking a relaxing stay. Eden Village Spiagge San Pietro is a mere 300 m from the sea, on a splendid stretch of coast in south-eastern Sardinia. The territory of Castiadas, renowned for its long stunning beaches, boasts a pristine natural environment and a rich archaeological heritage. A few miles away, the lively resort towns of Costa Rei and Villasimius offer restaurants and bars, shops, boutiques and a wide range of services. A lovely family-oriented resort a few steps from the sea, Eden Village Spiagge San Pietro spreads on an extensive green area with its unobtrusive graceful white buildings, which connect with the exterior with furnished balconies and patios. Between a plunge in the pool and an al-fresco dinner, the sea breeze will accompany your relaxing stay. The 114 rooms of the resort are welcoming and highly comfortable, furnished care and simple design. They all have telephone, satellite TV, air conditioning, minibar, safe, en-suite with shower and hair dryer. They are arranged in graceful two-level courts; all the ground-floor rooms have a patio, while those on the first floor have a balcony overlooking the garden. The hotel offers its guest a reserved, equipped beach area on the San Pietro beach a beautiful stretch of fine white sand at just 300 m from the hotel’s main building. Each room has an umbrella and two sun loungers available at no extra charge (a charge applies if you choose the first or second row from the sea). At a short distance lies some of the most stunning beaches in this part of Sardinia, including Cala Pira, Monte Turnu, Cala Sinzias, Santa Giusta and Sant’Elmo. The hotel’s entertainment includes a rich daytime and night-time schedule with tournaments, cabaret, sports activities and shows in the amphitheatre. The kids are kept busy and entertained by the activities of the Tarta Club (3/12 years) and the Jek Club (12/18 years). The hotel’s restaurant offers a choice between the air-conditioned dining room and the stylish outdoor patio. The buffet-style lunches and dinners feature a broad range of regional and national specialities, while once a week the menu is dedicated to the local traditional cuisine of Sardinia. The breakfast buffet has a wide selection of hot and cold foods, including continental and English breakfast. A special menu is available for kids, who can eat in a reserved area, together with the activity leaders. During the restaurant open hours, an equipped area is available to parents for preparing baby food (microwave oven, bottle warmer, steriliser…). The price of your stay includes private parking, free Wi-Fi at the reception and free access to all common areas and facilities: the swimming pool with sun deck, the kids’ pool, the five-a-side soccer pitch, the two tennis courts and the archery range. Available at a supplement: beach towel rental (deposit required), car, motorbike and bicycle rental. Nearby rental services are available for boats, inflatable boats, laser boats, windsurfs, canoes and pedalo. It is also possible to practice water skiing, slalom skiing, banana boat, sea excursions, scuba diving and horse riding. 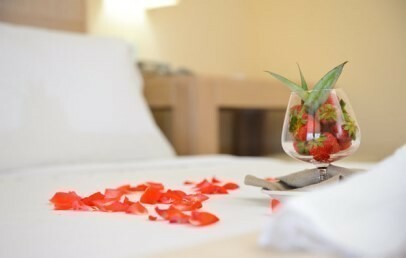 The rooms of the resort are welcoming and highly comfortable, furnished care and simple design. They are arranged in graceful two-level courts; all the ground-floor rooms have a patio, while those on the first floor have a balcony overlooking the garden. 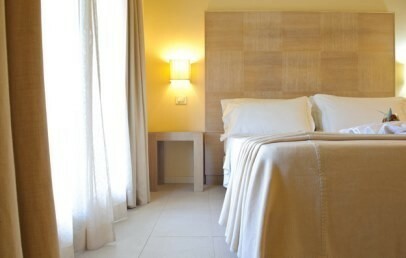 The rooms for three or four guests have sofa beds (170 cm) for the third and fourth guests. The Family rooms comprise two separate areas with four beds. The rooms of the resort are welcoming and highly comfortable, furnished care and simple design. They are arranged in graceful two-level courts; all the ground-floor rooms have a patio, while those on the first floor have a balcony overlooking the garden. Third bed (170 cm). 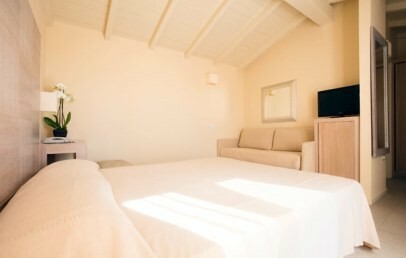 The Junior Suites comprise a double bedroom, a living room with three sofa beds and en-suite. Special 7 nights - Book 7 nights and last night is free of charge! Long Holiday - Book 14 nights and last 2 nights are free of charge!